Love your cat or dog? Know someone else who loves their furry companion? 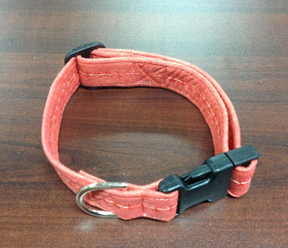 Join instructor Cindy Dahl for this fun evening class and make one of these cute collars. We didn’t do it on this sample, but if you’d like to use one of our machines to embroider your pet’s name and phone number on the collar that would be a bonus feature. Depending on how quickly you sew you might end up making two or three collars (you know your pet needs a different collar for each holiday season, right?) or make a matching mini-tote to carry your phone, keys, and doggie bags when walking the pup. Sign up today . . . class limited to six students.